Comments: The discussion on quad reminds me that when KMOD signed back on the air for good in 1974 they broadcast in the ill-fated quadraphonic format. To my knowledge they were the only Tulsa broadcaster to do so. The jocks talked into two microphones. To make their voice go 'round the room they would separate the mics and move their heads side-to-side, mic to mic, as they talked. Their moniker at that time was "Quadraphonic Ninety-Seven-And-A-Half". Comments: Rhymin'Simon was the only quad record I ever bought. I never heard a good system or a good record. My system was not too good. Where did all the old quad units go? Tom Hufford (Huffy the Clown) lived across the street from me when I was kid and his dad had a garage full of electronics, always something new. He was a ham operator and was into all kinds of electronics. He even had a video camera and recorder at home - and that was about 1965! He was a nice guy, letting me come over and use his equipment to repair my gear when it went south. Comments: 4 channel system called matrix I think (or "SQ" = Surround Quadraphonic...webmaster). I do know for a fact however that Zappa did the first quad LP that worked on it ("Overnite Sensation" and "Apostrophe"...webmaster). Yes, I had all 4 channels hooked up ...that was when I was first married....uh, system got sold...ya know? Comments: I had a Radio Shack Quad decoder amp courtesy of my brother 25 years ago. He worked then for Radio Shack - it was a clearance item 10w. amp that decoded all systems then on the market but I had only 2 speakers! It burnt up after about 20 years of use by me and later a friend that I re-gifted it to! Comments: Anyone get a quadraphonic setup at Sevco? Comments: TU friends from KC always talked about Burstein-Applebee or Wolferman's - duh eeeelectronics and gourmet food - what else do yuh wantin' Tulsey? Ibid on all the electronic stores - you all have named the suppliers of most of the TV station suppliers back then! The TDC deck my friend has was made by Bell & Howell to compete with Wollensak - big and heavy duty. Guys coming back from 'Nam brought Sony decks but Roberts/Akai was the most popular in PX's, I am told. I saw my first portable reel-to-reel Akai video camera way back when KPRC fed back video of, I think, the Huntsville prison riot to Houston using the then-unknown MCI microwave network. Comments: Dang! When you start talking about the parts stores, you go right to my heart! Radio Inc. was definitely the place to go for hard-to-find parts. S & S was great, too. But although it's a bit of a joke today, but in the '60's I could get parts very quickly without going downtown at the Radio Shack at 27th and Harvard. I believe the place in the tin building on Sheridan was Lafayette Radio Electronics. From time to time I could get needed radio tubes there as well. Also, the RCA parts depot at 42nd and Sheridan (I believe) was great for getting those honest-to-gosh RCA tubes. Man! Those were the days, huh? Comments: I noticed some comments about the early reel-to-reel tape recorders. Some of the old guys might be interested in hearing that I have two old '50s-vintage Eicors, neither of which works. I still have tapes that were made on that machine back in the early to mid-fifties. I remember that Harry Wilson had an Ekotape at the same time I had my Eicor. The Japanese Terecorder I bought in 1958 was a big step forward for home use. As a matter of fact, I also have a Roberts and an Akai that don't work. But, what the hell, I don't either. I found a view of a 70s teenager's bedroom full of electronic gear. Mine never reached this density, but I still use the pictured Kenwood amp and Pioneer turntable (purchased from "try it, you'll like it...SEVCO", downstairs at Southroads Mall), and I used to have the TEAC tape deck and Realistic amp. Dan D. Dynamo, aka Danny Williams, who announced "Championship Wrestling", seen in Tulsa in the 60s and 70s. Of course, Foreman Scotty got his start on Tulsa TV. Hopefully, I'll be there sometime this summer right after I make a pit stop at Freddie's hamburger joint! This is a picture of the delivery boy at S & S Radio Supply back in 1975. It is "yours truly" and I am standing on the back dock. One of the girls I worked with took the picture as we were getting ready to go have lunch. I am pretty sure the young woman on the calendar did deliveries before I took the job. I heard she quit to take a job as a model. Maybe not. I do remember a lot of rock musicians coming into S & S to buy electronic parts back then, including Leon. There is a pretty nice electronics store at Sheridan Village now. Drop in. 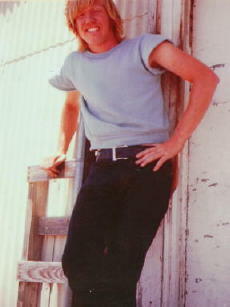 This shot is from the 1975 calendar for the lady customers. Comments: The name of the store I was trying to remember was Oil Capital Electronics at 7th and Sheridan. I knew my old buddy Joe Stewart worked there in the 50's so I emailed him and he set me straight. The store is probably long gone by now to make room for those crummy 'Shack' type 'lectronic joints. Comments: Lee....naaaa...Radio Inc. was always the place. The last time I was in town (2001) it was still there although a faint shadow of what it was in '58 when I started hanging around. There was another radio store near the Coliseum location but I don't remember the name of it. There was still another radio parts house on Sheridan in a metal building near the airport...don't remember the name of that one either. Radio Ink was the place with the good stuff. 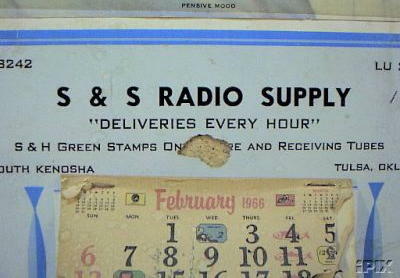 S & S Radio Supply was at 7th & Detroit, near the Coliseum. If she was the delivery girl, I'm sure they did OK. Comments: We're on stores now? Wow! When I came here in '57, downtown was the place; Siedenbach's, Vandevers, Clarke's "Good" Clothes ("Dance Party" sponsor), Street's. I remember in 1961 I paid $75.00 for a pair of slacks there. A fortune! As for electronics and audio, it was "Burstein-Applebee", close to 41st& Sheridan. I still have a "Wollensak" (3M) reel to reel from there that I still use as well as one of the first digital calculators from TI. How about S & S Radio? Comments: There's a small variety store near Main and Taft in Sapulpa that has assumed the old TG&Y logo and name for their store. My church has a small TG&Y brand color television set that still works! Comments: Thanks for the info! That answered a couple of questions. I did a little research, and apparently it was the Cherokee mall at 21st and Garnett that got hit by the '74 tornadoes. I remember I refused to go into that Humpty Dumpty for years after they repaired it. (I was like, 10 years old...) I get a little confused as to what stores were where, and what was damaged, but I seem to recall the '75 storms damaged the Safeway and the Braums on 129th, in the same general area as the Cherokee, as well as messing up the Plaza 3 Theatre pretty badly. You can see a bit of the Plaza 3 on the new KOTV 1978 in review page. Anyway...I'm thinking there was an OTASCO at one end, a Humpty Dumpty, and TG&Y at the other end...or was that strip mall further south on Garnett? I seem to recall that TG&Y becoming a thrift shop. I thought it was Cherokee Village, but I may be getting it confused with another strip mall. I know one of the malls later added a bar called "The Stage Door". I also recall what started out as a "Top Dog" restaurant which changed owners about every three weeks for several years in front of one of those 2 malls on Garnett. Comments: TG&Y. I loved the place as a kid (mine was at Admiral and Garnett). Most people I knew went with the Turtles, Girdles, & Yoyo's version. Although for some reason my family also thought of it as Trash, Garbage, & Yuch. "Then there was the non-enclosed mall at 51st and Memorial, catty-corner to the cemetary, whose name I can't recall, which had the disco at the height (?) of that fad...."
Isn't that the Fontana? Am I wrong? You're right, but did the cemetary really have a disco? Disco wasn't dead, then. Comments: I just made a discovery while listening for the first time to the "Music from Mr. Lucky" CD I mentioned ordering below. The tune "March of The Cue Balls" is music I've strongly associated with Channel 6 in the 60s. I recall it being used to get into and out of commercials, etc. You can hear an excerpt of it on Amazon's listing for The Best of Mancini. Added this info to the Gift Shop. Location: In the bathroom, dying my hair orange. Comments: My wife thought that T.G.& Y. stood for "Toys, Goods and Yards", yards being cloth. The T.G.& Y. that I went to the most was at McLain Village. In case you didn't know, the trio that started T.G.& Y. resided in Oklahoma. Comments: Read about my recent encounter with Sandra Bullock here. And I enjoyed seeing and interviewing "Joan Rivers" on Thursday. OK, this time it was a female impersonator: Frank Marino, star of LA CAGE. Funny guy! "After the colored egg rumor was disproved, my good friend Mike Rudolph (his family owned the motorcycle shop on 21st Street just East of Lewis around the corner from Cy Tuma's home) and I flew model airplanes where the medical center is now." I meant and should have said 15th Street. Tuma's home had a screen door that had his name on it....don't see that type of personalized screen door anymore. Comments: Thanks for all the info on Utica (and TG&Y) guys! When I was a kid, we all thought TG&Y stood for "Toys, Games and Yoyos". We used to frequent the one on Garnett Road, back before the '74 storms tore up the Cherokee(?) shopping center. I suspect "TG&Y" was probably a lot easier on the promotion budget than "Thomlinson, Gosselin & Young". Comments: While I was doing my earlier search, I came across a picture of a TG&Y brand "Five Transistor Radio". Good one...I used it previously in Gary Chew's interview. Per some info I dug up on the Internet, the TG&Y logo was the initials of the three founders of the company, Thomlinson, Gosselin & Young (no relation). Quite the imaginative trio, weren't they? LOL. Comments: Just what did T.G.&Y. stand for? I always thought it was "Turtles, Girdles, & Yo Yo's"
Comments: I was supposed to meet Gaby Tabunar, who was head of the Philippine Foreign Press Association, when I was a roving for CNN some 20 years ago, but for some reason related to Ferdinand Marcos, the trip got cancelled, and my chance to rub Manila shirts with greatness was dashed. Good to hear Gaby's still cranking 'em out. Besides Morris in Cairo, other notable voices from the 50/60s era in the same category included Andres Meisels in Tel Aviv, Richard Blystone in London (a terrific old-time reporter and writer who was, like yours truly, a CNN original), and, of course Jay Barbree from Cape Canaveral/Kennedy/Canaveral. I've been pleased to see Barbree pop up on MSNBC in recent years, presumably still as spry as Gaby. Comments: You will probably see a report by CBS' "man in Manila" and one of their longest working field men on CBS News today. Gaby Tabunar. Normally heard on CBS Radio every few monthes on reports from the Pacific - "Gaby sightings" on CBS are getting less and less. Gaby had a long piece on doctors leaving the Phillipines to take nursing jobs in the US because they pay better and on the general medical careworker flight from the Phillipines to the US - again for better pay and security for families. Comments: TG&Y at Utica Square....now there's a memory I can share. In the mid 50's I lived just East of Monte Cassino on 22nd Street so I was at Utica Square quite a bit and around Easter time every year I used to go into TG&Y and buy baby chickens that had been dyed different colors....somehow, I had it in my early teenage mind that they would grow up and lay eggs the same color as their feathers! After the colored egg rumor was disproved, my good friend Mike Rudolph (his family owned the motorcycle shop on 15st Street just East of Lewis around the corner from Cy Tuma's home) and I flew model airplanes where the medical center is now. My first job was at the grocery store which is still there, don't remember the name of it now and it probably has changed owner anyway. The Christian Science Bookstore used to be a hobbyshop I hung around at also. The 24 hour drugstore was across 21st Street...don't remember the name now. Oh....I remember my grandmother asking what kind of store TOGO&YO was.....I reluctantly informed her that was pronounced TG&Y.....she thought the 'periods' (dots) after each letter in TG&Y were 'ohs'.....hehe...well, the dots were pretty large so what did she know anyways....we all got a good laugh. Comments: We were musing at work on names of businesses and I thought of CLARKE'S GOOD CLOTHES. Did the name mean all others were bad - no, remember when we all weren't "Office Casual" in dress and had GOOD clothes for church, funerals and family events? We are sitting here today on a major video conference and Tulsa's own wacky Dr. Gene Scott is a signal up on an adjacent transponder (AMC 3 - C band 20) 24/7 - so he is our refence for folks tuning dishes till we "are hot" on channel 19. Does anyone know how Dr. Scott funded buying a satellite transponder - for like forever? Does anyone in Tulsa go to his church - wherever it is? We are never sure if he is still alive or just a video image beaming out to the world. Today he is in riverboat gambler attire and smoking a "see-gar" with somebody rolling in an out of time shot off VHS of folks applauding him from other events. Quickly call him at 800-338-3030 (as we used to say for Pastor Pack on KTUL). Later note from Mike: I stand corrected - Dr. Gene Scott is only put up on the satellite in Tulsa! He lives in L.A. Comments: It's my understanding that Utica Square was based on 'The Plaza' in Kansas City. There's even the sister building to the Sophian. Comments: Alistair Cooke has died at age 95. In the early days of PBS he was great but go back and read his reportage and he is better. A great chronicler of our time. He was 95 years young. I am sure that Amazon.com has a lot of his work. By the way, thanks to everyone who places his or her Amazon.com orders through this site. I get a small credit (at no extra charge to you) when you place an order after having arrived at Amazon via any link (like the TTM Gift Shop) on this site. When I get my copy of Mr. Lucky/Mr. Lucky Goes Latin in a week or so, I'll put it on and toast the fine readers who made it possible. When I moved to T-Town in '76, the TG&Y was still at Utica Square, I think, though I remember observing it as an incongruity in that becoming upscale deal. Utica was sort of the analogue to KC's Country Club Plaza, the "first shopping center" outside downtown. Woodland Hills was very new and waaay out in the country at 71st & Memorial. Bought tires for the Volare at Sears there, maybe the first radials I ever bought. Dillard's was the other anchor store, and there was a lot of empty smaller retail space in the midst of the mall. Go towards the river through the empty fields on 71st and there was the cool McCartney's grocery. Great selection, but prices a little stiffer than the Safeway at 61st and Sheridan, which also had a TG&Y, as I recall, next to the Methodist Church. Then there was the non-enclosed mall at 51st and Memorial, catty-corner to the cemetary, whose name I can't recall, which had the disco at the height (?) of that fad. Bent an elbow in there a couple of times with Broo. And what about Vickers gas stations? Location: It ain't the kick-off of Xmas if it ain't the tree lighting at Utica Square! Comments: "Uterus Square" in the early 70's to me was Petty's/Wolferman's for neat food (I had a charge card from there as a TU student! ), Et Cetera Shop for dorm and Xmas goodies, John A. Brown for clothes (saw Richard Roberts in there shopping a lot - my first glimpse at a local celebrity) and I too can't remember all the restaurants that came and went. Do remember the blue-haired ladies playing the organ in Furr's. The People's Drug (or whatever OK chain it was...) there was the closest 24 hour drugstore then to TU. What was the something Garden on the East side? I ate there several times with Demi Rosenthal and folks way back when. Bought a silver fish keychain at a jewelers there as a galpal gift one Xmas. If I was there with Leslie MacDonald we always ran into one of the nuns who had taught her at Monte Cassino. Comments: My grandparents were regulars at the cafeteria in Utica Square. I went there with them many times. It was Danner's. Comments: Utica Square wasn't always so upscale. Come, my students, and sit at the feet of an old man who doesn't always remember what day it is, and learn well today's marketing lesson. When Utica was built in the 50's, Whittier Square and Crystal City and Northland were about it outside of downtown, but Utica soon became "the" destination shopping area. Not only was there a T.G. & Y, but there was a bowling alley--Utica Bowl, and of course, the Medical Center, which not only provided rent income, but was very convenient for St. John's, and provided some assured extra traffic. This as well as other stores that I have probably forgotten over the years. Clarke's, Renberg's, Brown-Dunkin, Miss Jackson's, Wolf's-Petty's, a cafeteria the name of which I can never remember, and others. Interesting mix for the 50's consumer. And, of course, free parking. Acres of it. At the door. Store mix--getting the right kind of retailer in at a rent the store is willing to pay, which in turn fits with the marketing plan for the customer profile, has always fascinated me, and Utica has defintely been revamped as far as its marketing plan goes over the year, but the savvy of the Helmerichs is what has kept Utica Square alive and viable, and able to compete with the larger "southern" centers. Remember, the Tulsa 50's customer beat a different drum, and the drumbeat has definitely changed over the years since 1952. Mr. Sam was just getting Wally World off the ground in Bentonville, and enclosed malls were something that was just being discussed as a new conecpt. Comments: Buddy Rich did a great jazz version of the Monitor theme so if you see it on any of his old CD's that's a "high energy" long form treatment of the song. "It still plays in mah haid". Gene Rayburn of Match Game fame was a long time Saturday host. The "Monitor theme" is on this CD at Amazon.com, where you can hear a sample. Comments: "Like the hot kiss at the end of a wet fist!" - That's what it felt like when I stumbled across this web site. Thank you! I grew up in T-Town in the sixties and seventies. Yeeesh, what a flashback! Comments: I don't know anything about Mary Lou's at Utica Square. My question is was there really a TG&Y at Utica Square? That seems a bit, er, not quite upscale enough for Utica Square by today's standards. Comments: Hi guys! Another question for you! Anybody here remember a shop called Mary Lou's Bakery? Apparently it was in Utica Square near a TG&Y. Must've been in the mid '50's. Any idea what's there now? Thanks! Comments: I too saw the news about Jan's passing. I had the opportunity to speak with Jan for a few minutes when he and Dean were at the TSF back in 1987. He was a wonderful man and great to talk with. He'll be missed by many. Comments: Jan and Dean recorded some of my favorite songs back in the sixties. I remember reading in the Tulsa World about Jan Berry smashing up his Corvette. He passed on yesterday, age 62, due to the lingering effects of his accident. I only saw Jan and Dean once and that was at the Tulsa State Fair a few years ago. Coincidently, I just watched the bio movie about the two on TV a couple of days ago. Comments: Monitor was broadcast on weekends on KVOO during the mid-1960s, I recall. It might not have carried the program later than that, but I'm not sure. I listened to some of the audio downloads on the Monitor site and I had forgotten how good it was. It now seems like a slightly more upbeat and lighthearted version of today's NPR Weekend Edition. Comments: KVOO was the NBC Radio Network affiliate in Tulsa in the 1950s and 1960s. I don't remember hearing "Monitor" weekends on KVOO, but I'm sure KOAM in Pittsburg, Kansas carried it through the early '70s. It has history, photos, audio clips (some which are 30 minute segments) and other interesting information. Being the history buff that I am, I thought I'd pass this link along. What stations carried this radio show in Tulsa? Does anyone know? Wow, quite a site! That Monitor "Beacon" sound is unforgettable. The book above (available from Amazon.com by clicking on the image) is by Dennis Hart, creator of the web site. Comments: Get ready for the Tulsa TV Weather Wars. It seems Fox 23 has thrown the first punch. They aired a severe weather special last night, "When Every Second Counts". In addition to their live radar "Live Precision Doppler", which was erected last spring near 66th Street North and Lewis, they have acquired something called "Vortex Storm Tracker". This enables 5 regional Nexrad radars to be shown LIVE at once. In reality, this technology is likely delayed by about a minute or so. KJRH, KOTV and KTUL are currently conducting live severe weather shows in various Green Country towns. I haven't heard of any of the three debuting new technology this year. Looks like a good chance of severe weather Saturday night, we'll see it all then! A recent thread about Wal-Mart, pro and con, was transplanted to an item in the Business & Commerce forum at TulsaNow.org. It was too heated and far afield for this site, but anyone wishing to continue the discussion has an excellent place to do so. We recently lost two pillars of the Tulsa music scene: bluesman Flash Terry and singer Debbie Campbell. George Shriver remembered hiring Debbie in 1968 as part of the group, "The Kandy Kanes," in an evocative piece. We were also sad to learn of the recent passing of Roy Byram, a technician at KOTV in the early 70s and a contributor to this site. We saw a KELi "Cash for Kids Club" card from the 60s. There was a Sasha Foo sighting. An article was printed in the Tulsa World this week about Carl Bartholomew, Don Woods and Lee Woodward. I can get a copy to you (through 3/31) if you missed it.